By Jon Greenberg on Wednesday, November 21st, 2018 at 11:27 a.m. This doctored photo has been shared on Facebook hundreds of times. We rate it Pants on Fire! A potpourri of false and misleading information was shared on social media in the weeks before and after the midterm elections of 2018. You didn’t hear that it was open warfare on the streets of Atlanta on Election Day? Rest easy. It wasn’t. How about those 1.7 million unregistered voters actually voting in California? Don’t worry. They didn’t. PolitiFact has partnered with Facebook to fact-check misinformation and hoaxes on the platform. Here are just a few highlights from an historic election season. About two weeks before the election, rudimentary pipe bombs began showing up in the mail of prominent Democrats, Democratic donors and CNN. The common thread was they had drawn the ire of President Donald Trump. The day before the FBI arrested a suspect, an outfit called Stranger Than Fiction News said the bombs were a false-flag operation. "MAGA bomber’ identified as former CNN employee who donated to heavily to Hillary Clinton," the website claimed. As events quickly proved, this was Pants on Fire wrong. When Cesar Sayoc, a man who drove a white van plastered with pro-Trump stickers, was arrested, the bloggers didn’t give up. "A lifelong Democrat recently registered as a Republican, covered his van with Trump stickers and began sending bombs that didn’t explode to Democrats," a Facebook post said. That’s wrong. According to Florida voter records, in 2012, the first time Sayoc tried to register, it was as a Republican. Another False claim. With Trump stirring his base with dire warnings about the caravans from El Salvador, Honduras and Guatemala making their way through Mexico, activists blamed liberal philanthropist George Soros. "Soros provides migrants with prepaid debit cards to fund illegal journeys," they posted Nov. 5, citing a News Punch website article. On closer inspection, the underlying source was an article about migrants in Europe. In addition, while the U.N. Refugee Agency had helped people fleeing Syria and other Middle Eastern countries with debit cards, Soros wasn’t a contributor. We rated the post False. Democrat Stacey Abrams aimed to become Georgia’s first African-American woman governor. 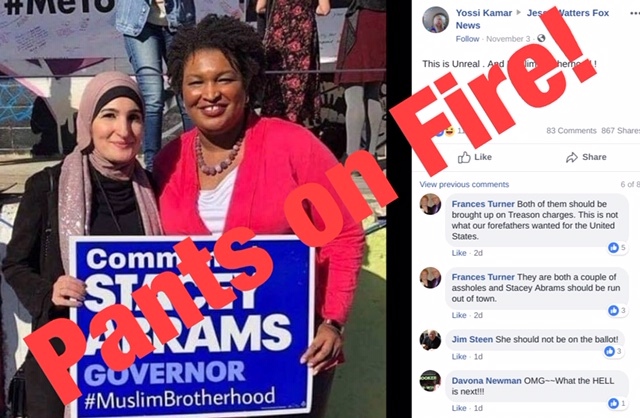 On Nov. 3, a doctored photo on Facebook tied Abrams to communists and the Muslim Brotherhood. Someone took an image Abrams had tweeted of her standing next to activist Linda Sarsour. They were holding an Abrams campaign sign. In the Facebook post, the words "communist" and "#MuslimBrotherhood" had been added to the sign. Sarsour is a Palestinian American who follows Islam. She has stated that she doesn’t support the Muslim Brotherhood. We rated this Pants on Fire. Georgia’s gubernatorial contest inspired another race-based claim. The eponymous Right Wing News website posted an apocalyptic headline Nov. 6, "Black Panthers Just Took Over City -- All Out War On Election Day." The city was Atlanta. That was Pants on Fire wrong. The headline was a dressed-up take on a demonstration that had taken place over the weekend. The Atlanta chapter of the New Black Panther Party –– not to be confused with the original Black Panther Party, members of which have disavowed the new group –– held what it called an "armed rally against voter suppression" on Saturday, Nov. 3. A handful of members bearing semi-automatic style weapons walked around Atlanta’s West End neighborhood. But calm prevailed on Nov. 6. "There is nothing happening at any of our polling places today that requires a police response," said Carlos Campos, public affairs director for the Atlanta Police Department, on Election Day. "We are not responding to the New Black Panthers or anyone. It’s smooth sailing." In another case, a photo of a man voting in Mississippi while wearing a racist T-shirt went viral after a Twitter post claimed he worked at the polling station. The T-shirt contained the image of a noose in front of a Confederate flag, along with the words "Mississippi justice." A Facebook post helped fuel the message that the man was a poll worker. But the man had no official role, and we rated this False. The picture was a real photo of a voter in Mississippi, but he wasn’t working at the polling station, according to election commissioner Paul Beale. So long as voters don’t display campaign messages where people cast their ballots, Beale said he was powerless. "We cannot regulate that; we cannot regulate stupidity," Beale said. "That’s all I’ve got to say about that." Leading up to and continuing after election day, there were allegations of vote rigging. Alex Jones of Infowars warned "Election fraud: Democrats are voting twice in Maryland," on Facebook Nov. 5. The post quickly popped up on Facebook’s alert system. The sole evidence was the word of a blind voter who overheard people talking at the polls. They didn’t mention Democrats, nor would double early voting be possible under Maryland’s process –– this was on Nov. 5 –– which relies on a digital voter registration database. Jones said the same thing was taking place in Texas. It all rated Pants on Fire. Before the polls closed in California, Facebook users were sharing a post that misquoted Judicial Watch, a conservative legal advocacy group. "Judicial Watch reports show 1.7 million California votes are not registered voters!" the post said. "Not ours," said Jill Farrell, a Judicial Watch spokesperson. "Just some random person misinterpreting." California, as does every other state, lists many inactive voters, that is, people who have skipped several elections. To assume that they voted in the midterms is an heroic leap. We rated the claim Pants on Fire. See fact-checks in the article.